GOG has added the 1995 point-and-click adventure Flight of the Amazon Queen to its library of complimentary titles. Earlier this week we let you in on a new (technically old) free game being offered by GOG. Now, we have the pleasure of talking up another pro bono offering the digital retailer is adding to its stock as a part of its fifth anniversary celebrations. Starting today registered GOG customers will be able to download Flight of the Amazon Queen free of charge. As with all of GOG's products, the title lacks any DRM. 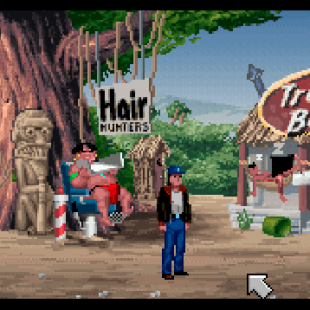 Flight of the Amazon Queen is a point-and-click adventure title released in 1995. Following pilot Joe King it's a fun tribute to 1940's pulp fiction that will see you tramping around the Amazon trying to stop the villainous machinations of the evil Doctor Frank Ironstein. While perhaps not as exciting a point-and-click addition as I Have No Mouth and I Must Scream, which saw a re-release earlier this month, it's nonetheless a free game, something that should theoretically silence any potential complaints. If you're perhaps looking for something a less point-and-click and more role-and-play, GOG is also hosting a weekend sale on several of its RPGs including titles like Wizardry 8, the Gothic series and newer titles like Legend of Grimlock. The sale gives you a flat 60 percent off each individual game, so it's pretty good deal if you're craving an RPG and have three bucks to spare. Of course, if you'd rather stick to free games, you can still head over to The Escapist's Good Old Reviews giveaway where we're currently handing out some free GOG titles ourselves.